Those of you who live in the UK may have heard or even read about the Moomins. 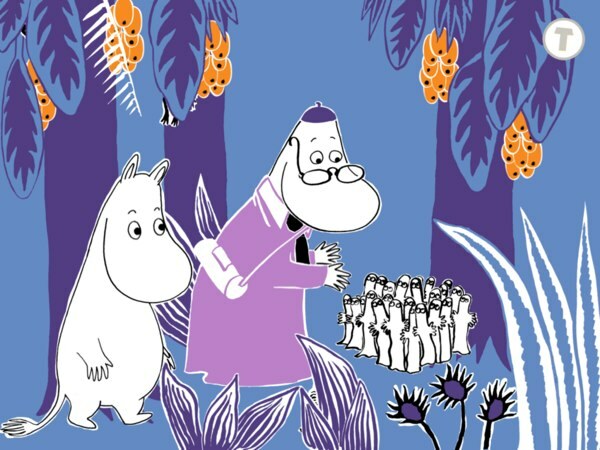 Created by Swedish-Finn illustrator and writer Tove Jansson, these bohemian, hippopotamus-like trolls are the central characters in a series of books, a comic strip and numerous television series that became popular in Finland and other European countries in the 1990s. In fact, they are so popular that they even have their own theme park! Today, I have an original storybook app that features characters from the Moomins series, titled Moomin and the Lost Belongings. In this short book, we follow the titular character, Moomin, as he helps his friends find the things that they lost. Help Moomin find the lost belongings. On a beautiful summer's day, Moomintroll (or Moomin, for short) goes on a walk around Moominvalley and finds its inhabitants troubled. 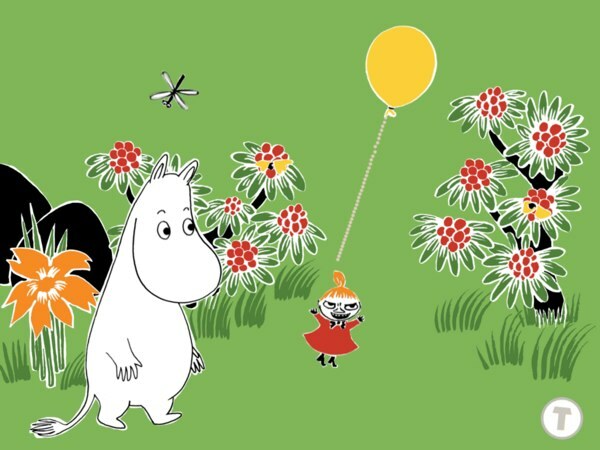 In each page of the interactive storybook, you learn that Moomin's family and friends have each lost a precious thing; Moominmamma can't find her handbag, Too-Ticky is missing her hammer, Snorkmaiden has her gold anklet stolen by a bird, and Little My has her balloon blown away by a strong wind! It is now up to you and Moomin to help save the day. After listening to each character's problem as read by the narrator, tap or swipe on the things in a scene to look for his or her missing belonging. Some items may be under rocks, behind the bushes, up in trees or even flying away in the breeze. Once you find a lost item, drag it to the owner to give it back. In total, Moomin and the Lost Belongings have 9 scenes plus 1 tutorial page to explore. The last page of the app lists all 9 missing items that you must find, and you can tap on each one to jump to the scene where you can find it. You can also decide to start over from the first page. It is notable that some items have different hiding places every time you come back to the app, providing you with extra challenge. Created specially as an app, Moomin and the Lost Belongings feature original illustrations and story not found in the Jansson's original work. That said, it was produced by the developers in co-operation with Moomin Characters and the publishers of the classic Moomin books. As an interactive storybook, many elements in the app can be manipulated using simple gestures. There is a nice tutorial at the beginning of the story that introduces you to the basic interactions in the app by asking you to find a milk bowl from under the three pails. The app offers two reading modes: Read to Me or Read by Myself. The Read to Me mode features a nice, subdued narration which goes well with the mood of the app. There is also an accompanying text narration in each page, which you can bring up by tapping on the T button. Tap on rocks, bushes, and even trees to reveal hidden objects. When using an app that is based on an existing series, ideally you should already be familiar with its plot and characters. However, Moomin and the Lost Belongings feature a general story which you can still enjoy without reading the classic books. I myself was not familiar with the Moomins before reviewing the app, but I enjoyed the story nonetheless. There is enough interactivity in the book to engage young readers, who I think will enjoy tapping on butterflies to make them fly or on rocks to reveal a family of hedgehogs. In addition, I like the simple yet charming illustrations. The characters are especially unique in their designs, especially the non-human ones. Finally, there is a sense of quiet which I like about the book. The narration is calm, akin to that found in The Going to Bed Book, which I found fitting for the mood of the story. It is also very rewarding, constantly thanking the readers for finding each missing item. The sound effect is minimal but effective, such as the gentle rustle of trees as you walk into Moominpappa's backyard or the chirping of insects in the Hemulen's forest. Simple and short, Moomin and the Lost Belongings make a great reading material for younger juniors. Moomin and the Lost Belongings is a gentle storybook app filled with charming artwork and amusing animations. Longtime fans of the Moomins will love this app, but new readers will also enjoy the compelling interactions as they search the scenes for lost belongings. Overall, it's a fascinating reading material that I would recommend.